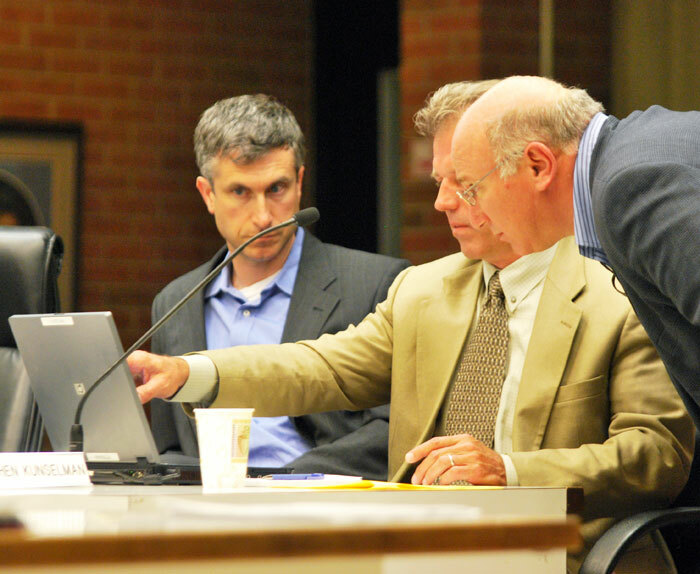 Higher utility rates – for water, sewer and stormwater – have received final approval by the Ann Arbor city council in action taken at its June 2, 2014 meeting. Water rates will increase across all tiers of consumption. For the first 7 “units” of water, the charge is will increase from $1.35 to $1.40. For the next 21 units, the charge is proposed to increase from $2.85 to $2.96 per unit. And for the 17 units after that, the increase is proposed to be from $4.88 to $5.08. A unit is 100 cubic feet, which is 748 gallons. At its May 21, 2012 meeting, the Ann Arbor city council gave initial approval to increased rates for drinking water, sanitary sewer and stormwater. According to the staff memo, the impact of the increases on an average single family customer come to 3.21% across three different rate increases – assuming the same level of consumption as last year. That 3.21% increase works out to $19.40 per year. Because the water and sewer rates are part of a city ordinance, the council will need to vote a second and final time on the rates, after a public hearing. Ann Arbor city council meeting (June 6, 2011, Part 1): While the largest chunk of time at the city council’s Monday meeting was devoted to consideration of ordinances regulating medical marijuana, the agenda was dense with other significant material. 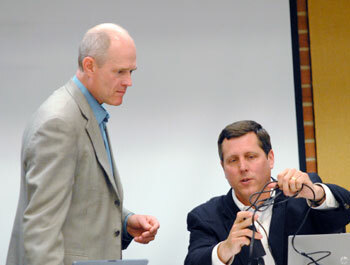 Mayor John Hieftje (standing) and interim city administrator Tom Crawford before the start of the city council's June 6 meeting. For road users who head to the polls on Nov. 8, possibly the most important issue on the agenda was a brief presentation from the city’s project management manager, Homayoon Pirooz, on the city’s street repair tax, which would reach the end of its current five-year life this year, if not renewed by voters. The city council will convene a working session on June 13 to look at the issue in more detail. Also related to infrastructure was the council’s initial action on setting rates for utilities (water, sewer, stormwater), voting unanimously to send the rate increases on to a second and final vote with a public hearing. The rate increases range from 3-4% more than customers are currently paying. All new and amended city ordinances require two votes by the council at separate meetings. The council also approved an $800,000 agreement with the Michigan Dept. of Transportation for the initial, right-of-way portion of the East Stadium bridges replacement project. Construction on that public project is due to start later this fall. For another public project, the council voted to add a previously budgeted $1.09 million to the construction manager contract for the new municipal center at Fifth and Huron. In an action designed eventually to reduce employee benefits costs, the council passed a resolution – brought forward by its budget committee – that directs the city administrator to craft an ordinance revision that would alter the way non-union employee benefits are structured. What’s planned is a change from three to five years for the final average compensation (FAC) calculation, and a change from five to 10 years for vesting. In addition, retirees would receive an access-only health care benefit. The city’s newest non-union employee is Chuck Hubbard, whose appointment as the new fire chief was approved by the city council on Monday night. Hubbard was previously assistant chief, which, unlike the chief’s job, is a union position. Hubbard has 25 years of fire protection experience, all of it in Ann Arbor. Expected to begin construction this year – in late summer – is a private development on the First and Washington lot currently owned by the city. On that lot, Village Green is planning to build a 9-story, 99-foot-tall building featuring 156 dwelling units and a 244-space parking deck on the first two stories. After much discussion, the council approved a $100,000 reduction in the purchase price – from $3.3 million to $3.2 million – that Village Green will pay for the First and Washington parcel. The price break came in the context of water management and a decision to use a full “bathtub”-type design for the foundation. The unanimous vote came after two councilmembers had already left the meeting (which pushed nearly to midnight), but it seemed at one point to hang in the balance, with two of the remaining nine councilmembers expressing reservations. Because the resolution involved land purchase, it needed eight votes to pass. Village Green’s project, a planned unit development (PUD) approved over two years ago, was not required to undergo the mandatory process of design review that is now part of the city’s code. The council gave final approval to that design review process on Monday night. The new ordinance sets up a seven-member design review board (DRB) to provide developers with feedback on their projects’ conformance to the design guidelines. While the DRB process is required, conformance with the recommendations of that body is voluntary. Also receiving approval at first reading was a revision to the landscaping ordinance. Fuller Road Station also drew comment from the public and the council. 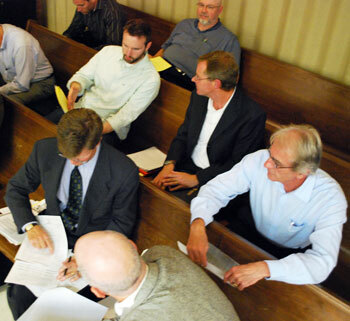 At its June 6, 2011 meeting, the Ann Arbor city council gave initial approval to changes in rates for drinking water, sanitary sewer and storm water. In terms of revenue generated to the city, the rate increases are expected to generate 3.36% more for drinking water ($664,993), 4% more for the sanitary sewer ($829,481), and 3.35% more for stormwater ($176,915). Because the rates are part of a city ordinance, the changes must receive a second approval from the city council, after a public hearing. According to the city, the rate increases are needed to maintain debt service coverage and to maintain funding for required capital improvements. The city’s drinking water charges are based on a “unit” of 100 cubic feet – 748 gallons. Charges for residential customers are divided into tiers, based on usage. For example, the first seven units of water for residential customers are charged $1.23 per unit. The new residential rate for the first seven units would be $1.27. Ann Arbor City Council meeting (June 7, 2010): Speculation that the vote on the Heritage Row project would be delayed was borne out on Monday night. Without discussion, the council postponed votes on the development’s rezoning and site plan until June 21. In other business, the council approved increases in water and sewer rates and gave initial approval to changes in the city code language on the placement of recycling carts. A wording change in the list of permissible uses for public land was also given initial approval, but not without discussion. Thematically related to land use was a presentation during the meeting’s concluding public commentary in response to a request for proposals (RFP) for the privatization of the city-owned Huron Hills golf course. Also receiving discussion was an item pulled out of the consent agenda that authorized $75,000 for Ann Arbor SPARK, for economic development. Criticism during public commentary on the appointment and nomination process used by the mayor to fill seats on boards and commissions stirred mayor John Hieftje to defend shielding individual members of those bodies from public demands.